The next morning in Kentucky, the chefs ransack Whole Foods for ingredients, and one chef has thrown his entire team into turmoil. Eddie had planned to do lamb loin in his dish, but as Whole Foods is out, he picks rack of lamb. Which is way more expensive. Way more. In fact, he uses up more than 1/3 of his team’s total budget, which results in his teammates having to jettison multiple items at the check-out counter in order to try and stay within budget. Ingredients are chucked left and right—poor Nathalie, already a loser in the Quickfire, can barely get enough lemons to make her lemon curd dessert. To his credit, Eddie is wracked with guilt and can’t stop talking about how bad he feels. He even offers to help his other teammates with their dishes. Few take him up on that. Things go from bad to worse on his team as cooking ensues. Eric doesn’t have enough oranges for his marmalade, Nathalie doesn’t have enough lemons for her dessert and the Kentucky heat is melting her lemon curd, someone knocks over Justin’s roasted corn, which means he’s barely going to have enough for his dish . . . it’s catastrophe after catastrophe for them. Meanwhile, some folks on the Red Team are behind schedule, but it’s nothing like what’s going on with the Black Team. Service arrives and the Black Team is up first. Kelsey has a cornmeal-fried catfish that is way too dry. Justin’s roasted corn hoecakes are good, but frat-boy Brandon’s confit chicken wing and biscuits are awful (they’re basically raw and dry in the center). Pablo offers up an Argentinean version of a Kentucky stew, but it’s super greasy and thin. The judges love Eric’s brûléed bananas, but Nathalie’s lemon curd pie is missing acid (not enough lemons!) and her dough is undercooked. Meanwhile, the partial cause of all this (Eddie) looks like he’s done enough to save himself, as the judges heap praise on his rack of lamb dish. It doesn’t appear that this is going to be a close competition, though, as the Red Team has a number of great dishes. Brian’s chicken and dumplings are great, as is David’s lamb, which has nice flavor but isn’t quite up to Eddie’s version on the other team. The judges love Michelle’s ham and cheese tartine, though it strays a bit far from its inspiration, and they adore local-girl Sara’s take on a chow chow, which feels homey and warm. 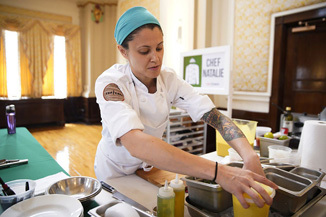 Kevin has a bizarre take on a corndog (it’s a banana inside, instead of a hot dog) is a perplexing hit—the judges can’t figure out why they like it—but it’s Nini who hits it out of the park with an amazing spoonbread that features flavors from her Vietnamese and New Orleans homes. Sure enough, the Red Team is the clear winner . . . which means that David’s Quickfire win (and the resultant immunity) won’t matter. One dish stood out, though, and it’s Nini’s spoonbread. In addition to hearing the editor of Food & Wine call her sauce “haunting” (in a good way), she wins $10,000. Pretty snazzy. So who’s going home on the Black Team? To his credit, Eddie immediately owns up to having monopolized their budget, but he’s not going home—the judges loved his lamb, and if it had been on the other team, he might have been up for the individual win. Rather, it’s between Brandon (who was THISCLOSE to getting immunity in the Quickfire) with his disaster of a take on chicken and dumplings, Pablo with his thin and bland stew, and Nathalie with her melting lemon curd, which lacked acid and a properly cooked crust. Though I’m rooting my heart out for Brandon to be sent home for his undercooked biscuits, Nathalie goes from winner one week to eliminated the next. I suppose it’s hard to make it through when you have both flavor and baking issues with your dish. And so it goes on Top Chef. With a seemingly stronger cast than ever, one slip up can cost you. And here, with bad dishes in both the Quickfire and the Elimination Challenge, it cost Nathalie. “When life gives you lemons,” she says sadly, “ask for more.” Tru dat.